Welcome to Math Salamanders Tessellations in Geometry sheets. 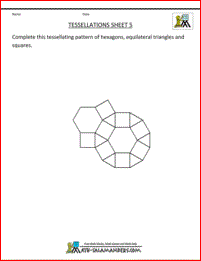 Here you will find a wide range of free printable tessellation sheets to support learning in geometry. Here you will find our selection of Geometrical Tessellation sheets. These fun sheets will let you explore the world of tessellating shapes and create your own geometric patterns to color in. create and explore patterns with 2d shapes. A tessellation is a repeated pattern or arrangement of 2d shapes that can fill any 2d space with no gaps or overlapping edges. Tessellations can be made from single shapes on their own or using a range of shapes. When we say that a particular 2d shape can tessellate, we mean that it can fill any 2d space with no gaps or overlapping edges on its own without needing to add any other 2d shape to fill up the gaps. Here is an example of a shape which does not tessellate. The pentagons are unable to fill up the space below on the page without leaving gaps. The tessellation sheet below explains all about tessellation in a little more detail. A regular tessellation is a regular polygon that tessellates. 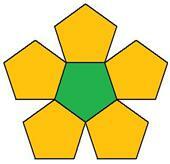 There are only 3 regular polygons which tessellate. The sheets below contain a regular tessellation activity to see which regular polygons tessellate. Have fun continuing these tessellating patterns. These patterns look fantastic when colored in! These tessellation sheets are more complicated than those on this page. create and explore more complex patterns with 2d shapes. 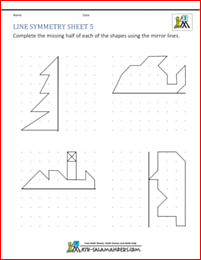 Here is our selection of free printable symmetry worksheets for 2nd and 3rd grade. learn how to reflect simple shapes in 2 mirror lines. Here you will find a support page to help you understand some of the special features that triangles have, particularly right triangles. 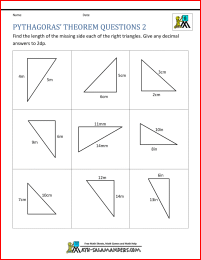 know and use and apply Pythagoras' Theorem. All the free printable geometry worksheets in this section support the Elementary Math Benchmarks.